Get a racing program (from any track - Thoroughbred, Greyhound or Harness). Fill out the simple form included with the "Profit Simplex" method. Bet according to my simple instructions. P.S. Up To 82% Win Factor (Proven)!! Here are 13 Reasons Why! Can be tested without risking a dime by using old programs. You'll be angry at how much $$ you could have made. You can start with just $10 and build fast with winnings only! Phenomenal in Concept, Never Seen Before! Comes Complete with nothing else to buy - EVER! You get all you need. Proven!! 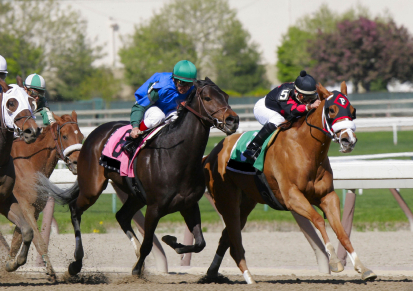 Tested at tracks across the country & Canada in over 40,000 races! Simple & Fast. Step-by-Step Instructions. Most anyone can rate a race in under 5 minutes. Completely Mechanical. Automatic, with no confusion on your part. Works at all tracks & OTB parlors. Works for Throughbreds, Harness, & Greyhounds. Win as many as 8 of 10 Exactas & Trifectas!